Once again, another month has gone by and I haven’t seemed to pull myself together to create a proper blog post. Just when you think you’re a motivated and organized person… sigh. It’s not for a lack of cooking here that’s for sure! I promise I’m redeeming my absence with this awesome and easy main course. 1. Whisk the soy sauce, sugar, wine, minced garlic, sesame oil and red pepper flakes in a wide low dish until the sugar dissolves. I used a big Pyrex low glass baking dish. 2. Slice the steak across the grain, on the bias into 1/4 inch thick slices. 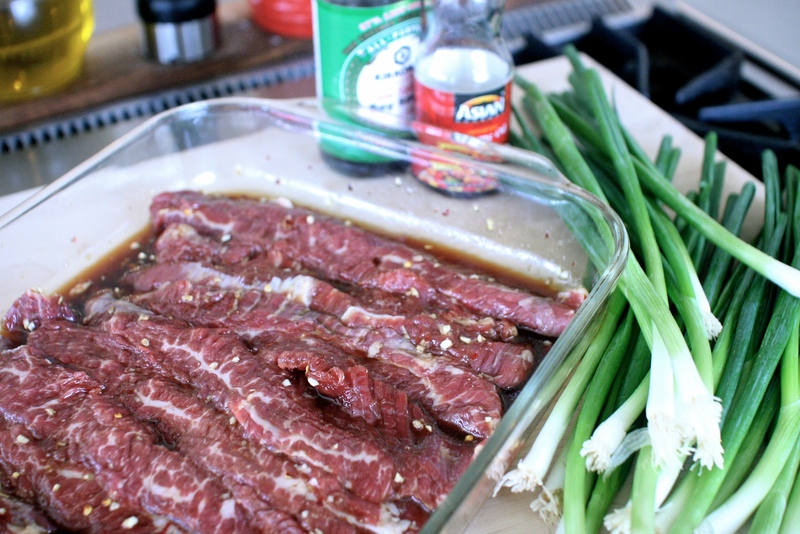 Add the sliced meat to the marinade and toss it around to make sure it’s evenly coated. Spread it out into a single layer, cover and refrigerate for a few hours or even overnight. Longer is always better. Flip it over once or twice while it’s marinating. 3. 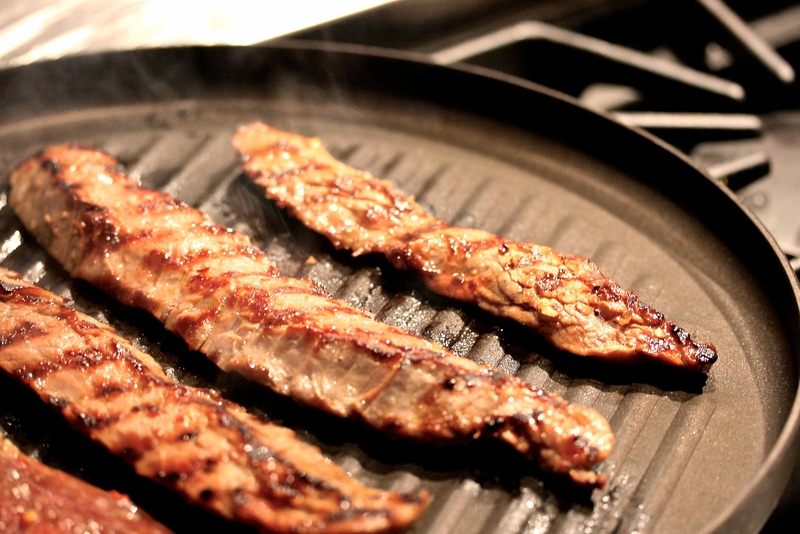 Preheat either an outdoor grill or a grill pan on high heat. Sear the meat on each side for about a minute or even just 30 seconds if you prefer it more rare (like me : ). You’ll may need to work in batches. 4. 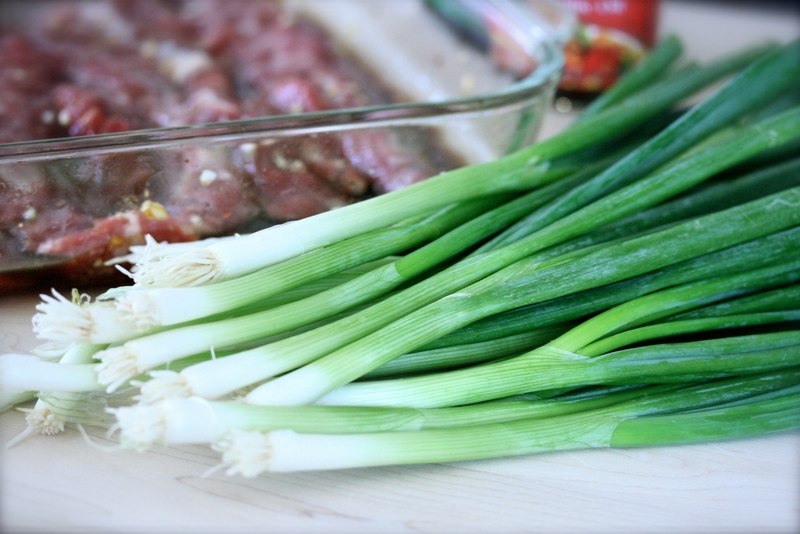 Rub the scallions with a little olive oil and sprinkle with some kosher salt. 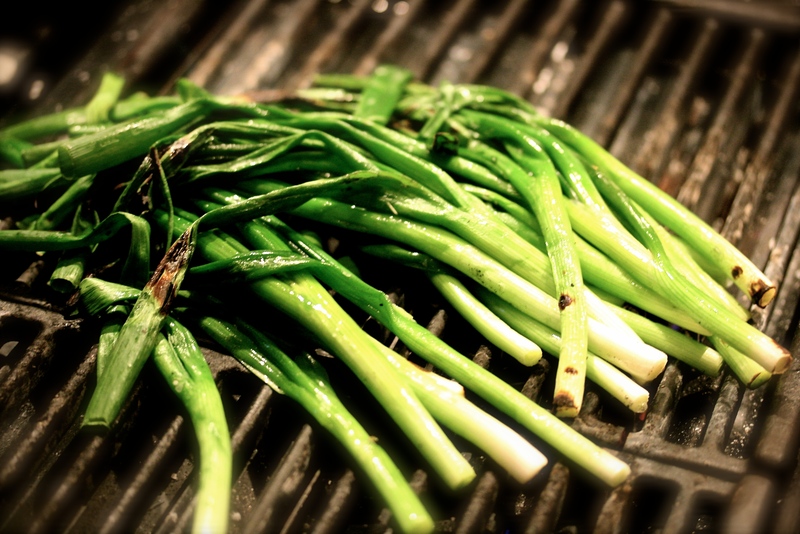 Place on the hot grill for about 2 minutes, flipping them around, until the dark green part begins to wilt and the white portions become tender. Serve on the platter with the steak. OMG!!! I have wanted to get this recipe from you for some time. Can’t wait to try it! Thanks! Sounds good, Nancy! Will try it next week when we have a couple of public holidays. Just have to find out what the cut of meat is called here. I think Flank has a bone in it. Will ask the butcher to cut steak from this piece for me. Hi Joan. Flank doesn’t have a bone in it, at least not here in the states. Your butcher should know it. Just noticed that you still have my old email address. I assume, of course, that you have changed it as I am receiving your blog on my new one! This looks so good!!! 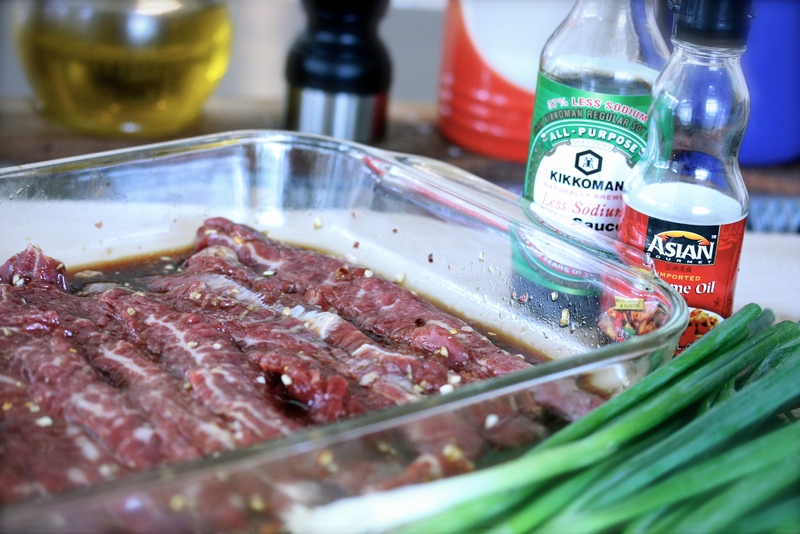 And I love flank steak, which takes so well to a strong marinade. Love your recipe! Thanks very much! 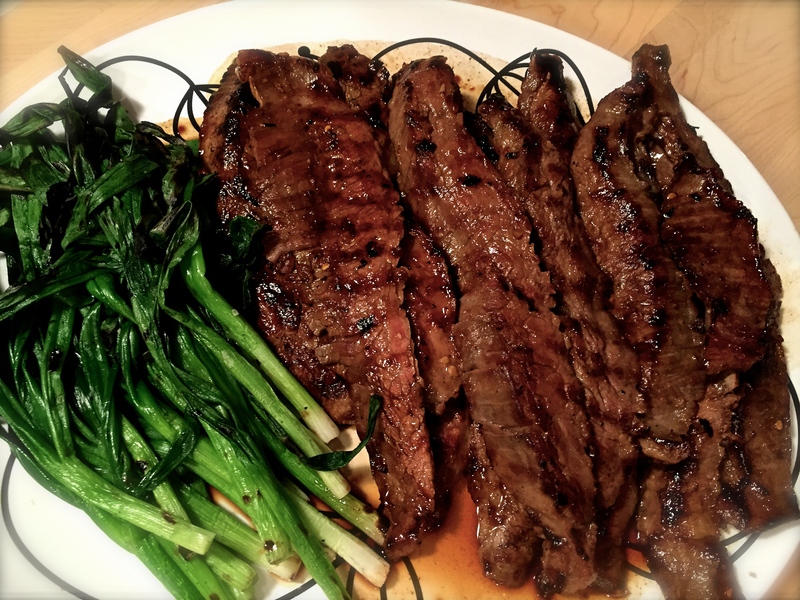 I like a flank steak too. They’re always great on the grill as well.